PHYSICIANS , CLINICS AND EMERGENCY DEPARTMENTS THAT DENY CARE TO VACCINE WARY PATIENTS NEED TO BE EDUCATED OR EXPOSED! The strategies currently being promoted by health care facilities across the country are getting pretty ugly. Many well educated men and women who refuse vaccines, such as tetanus shots, are being denied care. Attorneys have told hospitals, clinics and physicians that if patients refuse vaccines and then get sick from the disease the vaccine is “supposed” to prevent, the patients can sue for malpractice. 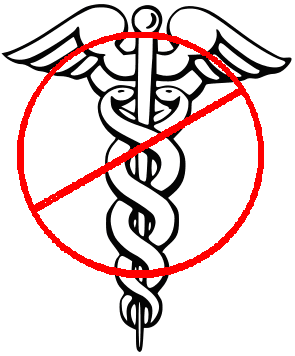 So, rather than risk the liability, some physicians are refusing to provide any care whatsoever. The reason this situation is occurring is partly because of the CDC’s Healthy People 2020 agenda (which is extremely well funded), partly because the attorneys providing ‘legal’ advice are themselves totally indoctrinated, and partly because the vaccination information provided to physicians is extremely well controlled by the vaccine pushers and beneficiaries.